This post started out as a Friday Five. But seeing as how a) there are only 4 things here, and b) it’s not Friday anymore, I’ve decided to call it my Monday Mishmash instead. If you follow me on social media, you might have seen me allude to this over the past couple of weeks. But I haven’t officially announced it yet. So here goes: I’ve been selected as a ZOOMA Florida Ambassador!!! In case you have no idea what I’m talking about – ZOOMA is women’s race series. ZOOMA races are “boutique events” in gorgeous resort destinations with a “fit girls weekend” theme and activities like yoga sessions and “mocktail” parties. There are ZOOMA events in Austin, Annapolis, Napa, Chicago, Cape Cod, and the spectacular Amelia Island, Florida, which is where I’ll be representing the #zoomanation. I was absolutely thrilled when I found out that I’d been selected as an ambassador. I actually applied last year but missed the deadline by just a week or two – so I (im)patiently waited for a whole year to reapply. If you’re not familiar with Amelia Island, you’re missing out! It’s in Northeast Florida, not far from Jacksonville, and it has beautiful beaches, state parks, Victorian mansions, a historic shopping district, upscale resorts, and so much more. You really have to see it for yourself to appreciate what a great little place it is. 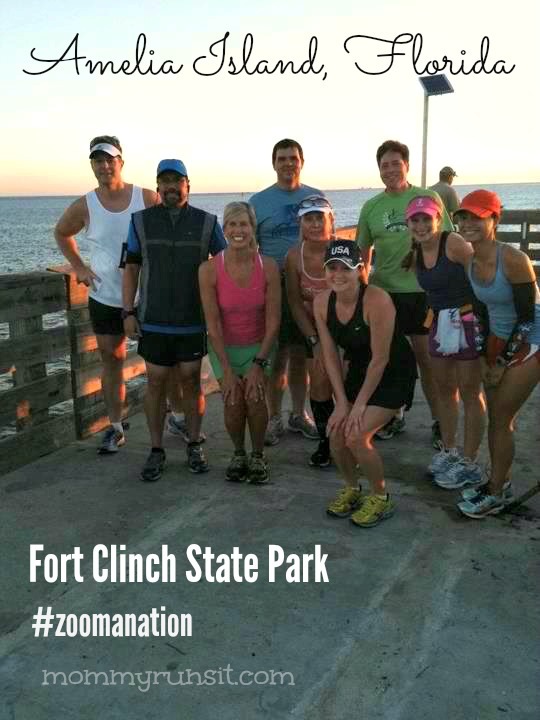 ZOOMA Florida will take place on January 17, 2015 at the Ritz-Carlton Amelia Island. There will be a 5K, a 12K, and a half marathon. There will also be some pre-race events in Jacksonville, which I’ll fill you in on when they get a little closer. For now, if you’re planning to register for the race, you can save 10% on any distance with my promo code – SHARON15. Last year, I had the honor of being an Ambassador for the 26.2 with Donna. I was part of the “local ambassador team,” and our primary role (as you can guess) was to help promote The Donna locally – distributing flyers, promoting events on social media, etc. There was a whole separate group of ambassadors who were tasked with repping The Donna in their own hometowns and nationwide – the “official” race ambassadors, if you will. This year, the Donna folks decided to merge the two groups. 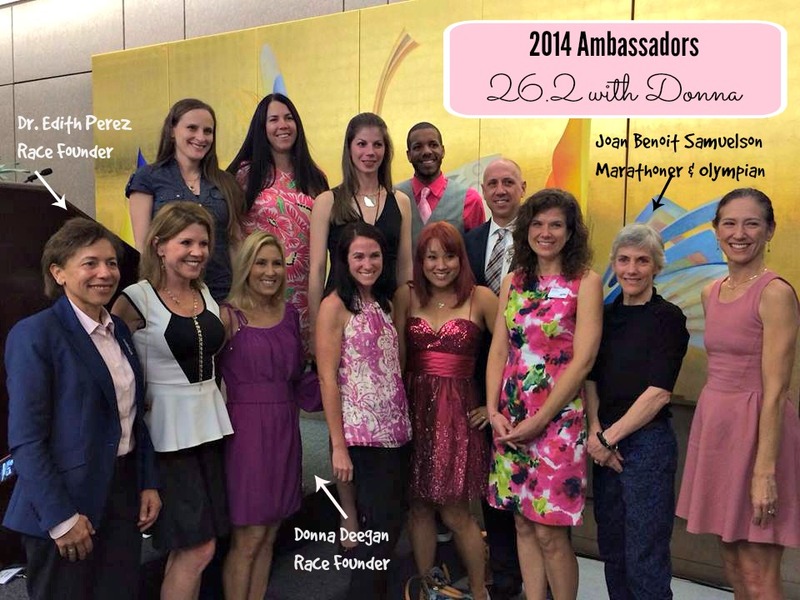 All 2015 ambassadors are official, and they all have the same responsibilities – which include raising awareness about the race and the mission, promoting and attending Donna-related fundraising events, and sponsoring individual fundraising campaigns. 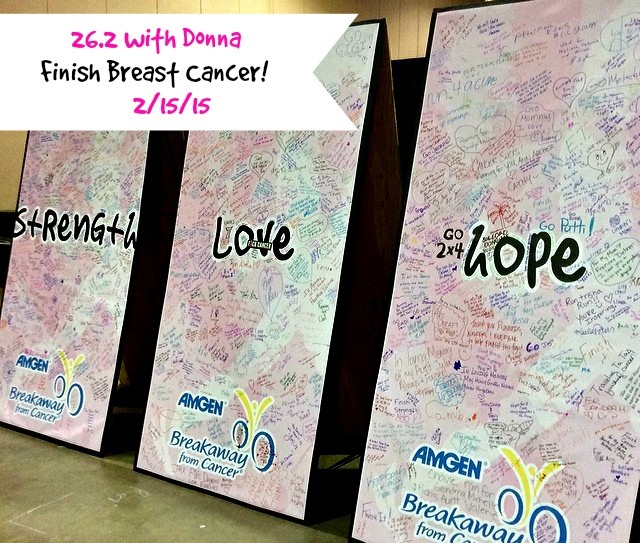 After all, the 26.2 with Donna is a fundraising event, with proceeds going to breast cancer research and The Donna Foundation, which provides support, services, and resources for individuals and families who are coping with a breast cancer diagnosis. As much as I loved being part of the Donna team, I knew that I wouldn’t have the time or the energy that being an ambassador would require. My plate is already too full, and it would have been selfish and irresponsible to accept an ambassador spot, knowing full well that my whole heart wouldn’t (and couldn’t) be in it right now. And I knew that there were plenty of people out there who could do a much better job at it than me. So when The Donna began their search for their 2015 ambassadors, I didn’t apply. I’m a little sad about it, but I know that I made the right decision. And I can still do my part to promote and support The Donna as just regular old non-ambassador me. Of course, the biggest way that I will be supporting the 26.2 with Donna is by running in it. Or at least that’s the plan. I started my third season of marathon training with the Jacksonville Galloway program this summer, and the mileage is starting to creep up. I had a bit of a rough start, but I feel like I’m starting to get my groove back. I had an awesome 14 mile run last weekend, and I’ve been incorporating more speedwork than before into my mid-week runs. Plus I’m running with my BRF’s (best running friends) again, which makes all the difference in the world. But there is a problem, at least potentially. Because of my responsibilities as a ZOOMA Ambassador, I will have to miss two long runs – 16 miles (October) and 26 miles (January). Plus I’m also missing the Jacksonville Marine Corps Half Marathon, which is incorporated into our training schedule, because it falls on Yom Kippur. So that’s a whole lot of miles that I’m going to have to make up on my own. I’m not sure how it’s all going to go, so for now I’m just going to have to take it week by week. And I’m trying to convince myself that it won’t be the end of the world if I run the Donna 13.1 instead of the 26.2. I celebrated my 40th birthday with my family, and it was perfect, right down to the amazing chocolate ice cream cake (OMG). So far it doesn’t feel any different than 39, but that’s probably because I haven’t had to fill in any bubbles with my age range yet. Speaking of birthdays, I’m going to have a belated birthday celebration on the blog sometime in the next few weeks. I haven’t decided on the details yet, but I’m definitely having at least one giveaway – and it’s one I think you’ll all like. Actually, if I can stick to my schedule, I’ll have several giveaways going on throughout October and November…so keep your eye out for details! I’ve also got another new post from my dad coming soon, plus a lot of stuff that I just need to get out of my head and onto this computer. It’s going to be a busy fall, y’all. What does your race schedule look like this fall? Anyone planning on running ZOOMA Florida or the 26.2 with Donna? Barnana - Now In Two New Flavors! Welcome to the ZOOMA Ambassador team! My fall schedule is a MESS! I am actually running the Marine Corps Half (although I am dragging my feet about it for a variety of reasons), the Space Coast Half at the end of November, the Divas 5K in St. Aug, the WDW Marathon in January (actually the week before ZOOMA), ZOOMA Florida (although the distance is still up in the air, depending on how badly the marathon breaks me), and then we’ll see from there. I am supposed to be starting a job in December, so I’m not sure if I will get to run the Gate or DONNA (although I did the 5K last year, loved it and hope that I can make it happen again). Whew! Now I need a nap! Hope we get to meet and hang out at the ZOOMA kick off event in a couple of weeks! I am super excited about being a Florida Zooma ambassador too! I will see/meet you soon!